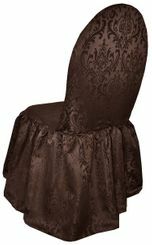 Damask Jacquard Polyester Skirt Chair Covers WeddingsFree Shipping over $150 - US 48 Contiguous States! $9.98 Flat Rate Under $150 - US 48 Contiguous States! 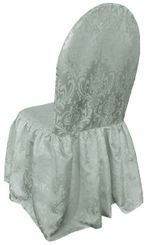 High quality brand new damask jacquard banquet skirt chair covers, our damask jacquard banquet skirt chair cover made from a high quality Heavy duty damask jacquard material with beautiful skirts. damask jacquard banquet skirt chairs cover are perfect for wedding reception, catering service, banquet halls, rental companies, hotels, restaurants, banquet halls, event centers and all special events.